This area is also earmarked to be a future global business and financial hub near Singapore’s future Waterfront City, making Marina One Residences perfectly poised to reap the extraordinary benefits of this area’s growth, and a space that’s truly worth having. Located in a highly coveted location, Marina One Residences is Marina Bay's definitive luxury residential. address. Surrounded by two lush green parks — the Marina Station Square and Central Linear Park — and together with Marina One's own Green Heart, Marina One Residences offers the rare opportunity for park-like luxury living, reminiscent of prized real estate developments around London's Hyde Park and New York's Central. Park, in the heart of the city. Marina One Residences is an integrated development that places you on the pulse of Singapore’s vibrant CBD and beyond. Comprising luxury residences, unique retail offerings and Grade-A offices, Marina One is nestled amidst lush greenery and green parks whilst seamlessly connected to 21st century infrastructure. Replete with stunning city and sea views, the award-winning Marina One Residences comes alive through the design of Christoph Ingenhoven, a leader in sustainable Supergreen architecture. The ingenious design of a lush central garden by Kathryn Gustafson then transforms Marina One into a luxurious oasis at the heart of the city, offering tranquillity and serenity amidst the city’s vibrant backdrop. Marina One Residences is a space shaped around you, and where you’ll truly feel right at home. Imagine living in a rich and beautiful oasis that’s vibrant, colourful and magnificently enchanted. Imagine strolling along a towering and majestic 13-metre tall waterfall. And imagine experiencing a new sense of serenity at the heart of the city while embracing its effervescent personality and charm. Set amongst 65,000 sq.ft. of lush greenery and spectacular waterfall features is a myriad of integrated private and public spaces within Marina One, a space that fuels your mind, body and soul. It is a space for you. Now, you can wake up to a lush flora surrounding even as you experience the conveniences of being centrally connected in the city. 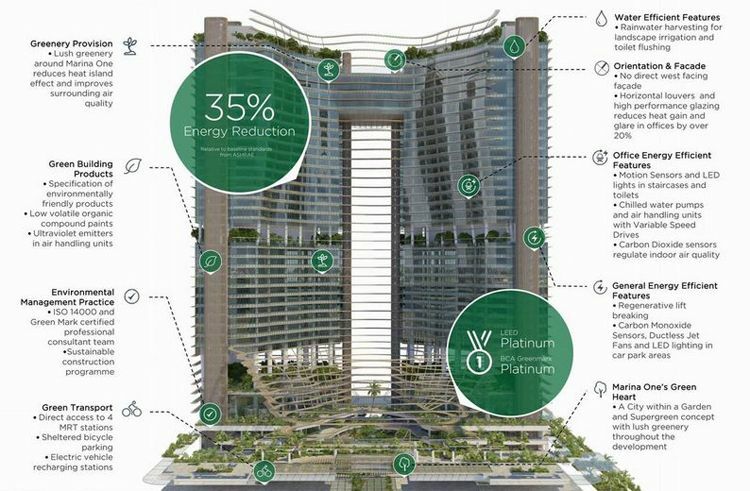 Simply put, Marina One Residences caters to the quality of life you have come to enjoy.